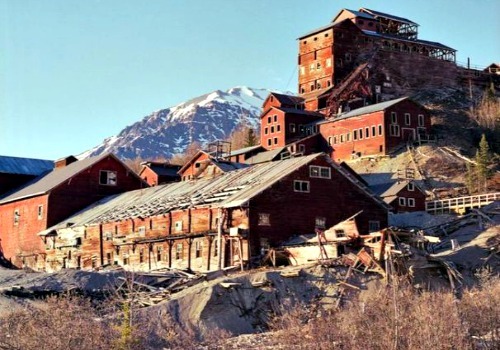 Are the Kennecott Mines Haunted? The area where Kennecott mines now stand was discovered by 2 prospectors in August of 1900 when they stopped in the area to graze their horses. Realizing the concentration of the copper in the area they quickly formed the Chitina Mining and Exploration Company with 9 of their friends. After word got out about the new ore deposit in the mountain, a man named Stephen Birch who was a mining engineer fresh out of school, bought the prospectors new find off them with money he borrowed from wealthy people he knew from the north-east. In total he paid the 11 prospectors $275,000, which in those days was a huge amount of money. Over the next 20 years copper came out of the mine much faster than anyone had expected, and this led to the discovery that the mine had the highest concentration of copper in the world. The mine made huge profits, with its peak year being in 1916 when a total worth $32.4 million was pulled out the ground. The town around the mine built up quickly and life here never seemed better. Though this was not to last as is the case with all of these old mines, and during the mid 1920's the end of the main bulk of the ore was in sight. The first section of Kennecott mines to close was the Glacier Mine which shut in 1929. The Mother Lode closed at the end of July, 1938. The final three mines named, Erie, Jumbo and Bonanza, closed in September of that year. Since the mining was over and people had no reason to stay in town it quickly emptied, with the last train leaving Kennecott on November 10, 1938. Today the mines are a tourist attraction and many of the town buildings have been left in the same state they were the day the people moved out. Judging from the look of this place and the fact that many people died in these types of mines there's certainly the basis for a good haunting, and one to many people have made the same claim's a little to consistently to dismiss this as another "camp fire" location. As for where people have reported ghostly activity here it would be faster to list to place where people haven't seen ghosts. One particular area that is known to be especially haunted is the railroad that ran from here and went through the Valdez and Chitina mining districts. People have reported seeing the apparitions of past workers walking by the edge of the line, as if following it to their old place of work, only to disappear when approached. The actual mine itself has a very eerie feeling to it, but then again any dark, long abandoned tunnel into the earth isn't exactly inviting. People have reported everything in the mine itself from the usual orbs and strange mists, to the sounds of miners shouting for help from the end of empty tunnels. There are even the ghosts of some of the miners families who are said to still linger in the town. With the main street being a favourite for ghostly activity, especially after dark. The whole area has a very eerie feeling to it and there isn't a single spot where you don't feel as if you are being watched.